This material shows its highest corrosion resistance with fine grinded and polished surface. The machinability of 1.4021 is comparable with alloyed heat treatable steels and causes no significant difficulties. AISI 420 - X20Cr13 - 1.4021 can be hardened by holding the temperature between 950°C and 1050° C with a subsequent cooling in air, oil or polymer. The strength of 1.4021 depends on the tempering temperature. X20Cr13 is usually divided in two heat treatment conditions, QT700 and QT800. 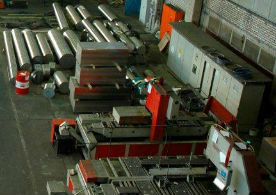 This material is used in mechanical engineering and power engineering. The german website for this project you can find under X20Cr13.